A Globe & Mail 100 Selection and long listed for the 2014 RBC Taylor Prize. 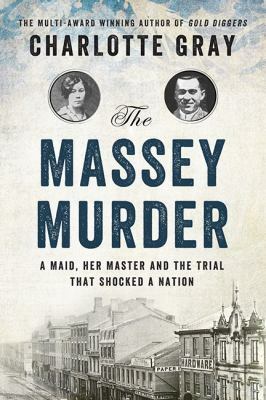 A scandalous crime, a sensational trial, a surprise verdict–the true story of Carrie Davies, the maid who shot a Massey In February 1915, a member of one of Canada’s wealthiest families was shot and killed on the front porch of his home in Toronto as he was returning from work. Carrie Davies, an 18-year-old domestic servant, quickly confessed. But who was the victim here? Charles “Bert” Massey, a scion of a famous family, or the frightened, perhaps mentally unstable Carrie, a penniless British immigrant? When the brilliant lawyer Hartley Dewart, QC, took on her case, his grudge against the powerful Masseys would fuel a dramatic trial that pitted the old order against the new, wealth and privilege against virtue and honest hard work. Set against a backdrop of the Great War in Europe and the changing face of a nation, this sensational crime is brought to vivid life for the first time. Multi-award-winning historian and biographer Charlotte Gray has created a captivating narrative rich in detail and brimming with larger-than-life personalities, as she shines a light on a central moment in our past. Charlotte Gray is one of Canada’s best-known writers, and author of nine acclaimed books of literary non-fiction. Born in Sheffield, England, and educated at Oxford University and the London School of Economics, she began her writing career in England as a magazine editor and newspaper columnist. After coming to Canada in 1979, she worked as a political commentator, book reviewer and magazine columnist before she turned to biography and popular history. She appears regularly on radio and television as a political and cultural commentator. Charlotte lives in Ottawa with her husband George Anderson, and has three sons. To learn more about Charlotte, visit her official website.